Pharmaceutical compounding corresponds to the preparation of customised medicines in order to meet the specific needs of patients, which cannot be met by the proprietary medicines provided by the pharmaceutical industry. Historically, pharmaceutical compounding dates back to the very origins of pharmacy and, ever since, it has been an integral part of pharmacy practice. 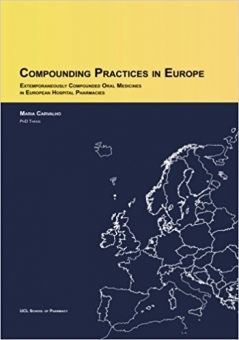 Nevertheless, little is known regarding current compounding practices in Europe and, therefore, the aim of this project was to identify and characterise the oral compounded medicines most frequently dispensed in European hospital pharmacies. The research method adopted was a large-scale, international (European) survey and the research instrument was a self-completion (country-specific) questionnaire. A total of 11 European countries were included in the research: Portugal, UK, Switzerland, Poland, Netherlands, Denmark, Slovenia, Finland, Spain, France and Germany. For most countries, a purposive sample of hospitals was contacted and invited to contribute data regarding the oral compounded medicines most frequently dispensed in their pharmacies. The pilot-study was launched in Portugal but fieldwork was undertaken in most countries. Information regarding legislation, professional organisations and information sources relevant to pharmaceutical compounding was also collected. The oral compounded medicines most frequently dispensed in hospital pharmacy varied considerably throughout Europe, from traditional cachets in Poland to complex tablets in the Netherlands and Denmark. A wide range of active substances, including NTI drugs, and dosage strengths were dispensed. Compounded medicines were prepared individually and also in batches of variable sizes. There is little consistency of compounding practices in Europe and there is a need for common legislation, professional organisations and information sources. This project corresponds to the largest and most complex research in pharmaceutical compounding across Europe and aims to contribute to the harmonisation of quality and safety of compounded medicines in Europe.